and a struggle for survival ensues. It has one of the most asinine plots ever conceived and the title itself sounds hokey and budgety, like something you’d catch on the Sci-fi Channel at 3 am, but aside from these worries, Snowpiercer is one of those rare films where its audacity and message alone outpace all other considerations. Korean Director/writer Joon-ho Bong, taking some ideas from a forgotten 1980s French novel, has created one of the most insane films I've ever seen. Some agonizing efforts have been gone through to blend the dark, crass comedy with the story’s dystopian drama, but it is a raging success—and a harsh lancing of class warfare as it is necessary in our world. I had the lowest of expectations for this film, but with Ed Harris and Chris Evans holding nothing back, it worked…and then a little. Not to be forgotten is Tilda Swinton's “Mason” in a performance so good that it is scary. Be ready to contrast the great performances with the ingloriously tasteless portrayals of poverty and abject squalor. Snowpiercer is, without a doubt, one of the most disturbing movies ever made, with cannibalism and portrayals of such filthy living conditions that it can be hard to endure for even the most avid horror fans. Irregular in styling – and certainly not for conventional moviegoers – it is only for those who pride themselves on an erudite critique of humanity and can stand its siren-blaring sense of humor, which will wear away fast the patience of most audience members. A viewer's greatest challenge may be taking it seriously enough to let all of its strengths shine. 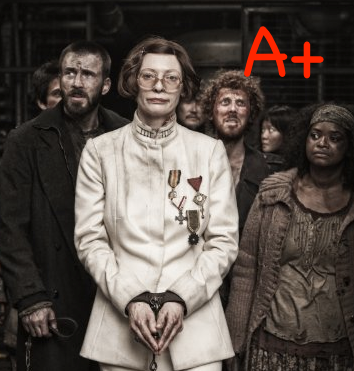 One thing is for sure: Snowpiercer is like nothing you’ve ever seen!